SRM first came to our attention in 2009. 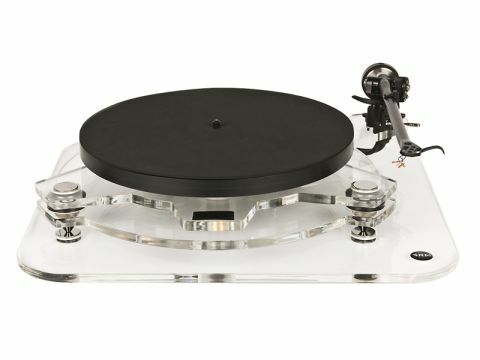 In fact, its basic Arezzo model won our coveted award for Best sub-£1,000 turntable. The full range includes the aforementioned Arezzo; the Arezzo Reference; Ultra and the Kinetic. All are supplied with similar features, but the Kinetic adds just one more, albeit a significant one: a flywheel which is interposed between the motor and the platter. Obviously the platter of any turntable is supposed to rotate at a constant rate and one thing that helps this happen is the inertia of the platter itself, which together with the compliant drive belt filters out any small-speed irregularities due to the motor or its supply. The Kinetic's flywheel is driven from the motor by a single square section belt and then passes the impetus on to the acrylic subplatter via a further four belts, giving relatively stiff coupling. In this case, the rotational momentum of the flywheel almost exactly equals that of the platter, so the effect is similar to doubling the weight of the platter. The motor itself is a low-voltage AC type, which is attached to the sub-chassis. This is a semi-suspended design, with the sub-chassis stood off from the plinth on sorbothane mounts which are reasonably compliant but don't give quite as much decoupling as springs. The plinth stands on conical feet on a further level of acrylic, but the three-level construction is still quite low-profile. The arm board is also acrylic and is to some extent decoupled from the sub-chassis. Our review sample came fitted with a Rega RB300 arm (not included in the price), complete with SRM's 'counterweight resonance controller' – basically a thick rubber band which wraps round the outside of the counterweight. A dust cover is available as an option. Once again, tonal balance could prove a deciding factor for many listeners – in this case a small lift in the upper bass. That's going to vary in effect with different loudspeakers, of course, and with the extended but neutral Bowers and Wilkins 803S we used for most of our sighted listening, it was perceptible but not bothersome. That's pretty much a constant: deep bass can suffer if the turntable is not isolated at least somewhat from a suspended floor. That apart, the Arezzo Kinetic does a lot of things very well. It has a direct, even forceful, presentation and places considerable emphasis on the rhythmic side of things. One listener used the word 'confident' in describing the sound and we could easily see what he meant by that, with dynamics and attack both full-on. The clarity the Arezzo achieves in the midrange is very welcome in separating voices from each other and from the accompaniment: it's the highest frequencies that occasionally seem a little blurred. Despite this, imaging is good, if not outstanding.